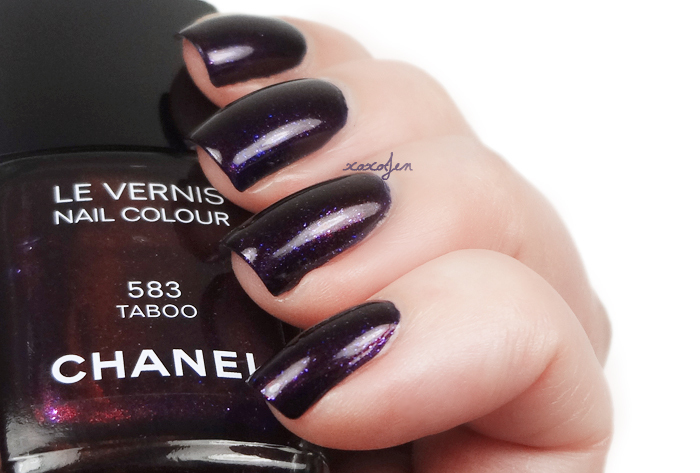 Digging around in my "pending blog" photos I came across this oldie but goodie: Chanel Taboo. It's a vampy shade with heaps of shifty shimmer...in the bottle. On the nail, not so much. A lot of the shimmer is lost and covered up by the dark base color when applied on the nail. Chanel formula, for me, is hit and miss. This one was better than my Paradoxal which was thick and awful. I used two coats of Taboo and it dried matte, and then ate my topcoat so I used another layer of topcoat. I have to say, I wasn't too impressed with this one - not worth it's hefty price tag. Thank you for visiting and I hope you have a wonderful holiday weekend! What a nice deep color for fall this is. It's such a shame the polish didn't work for you. I didn't have any issues with mine.